Skip this step if you have imported the theme demo content. 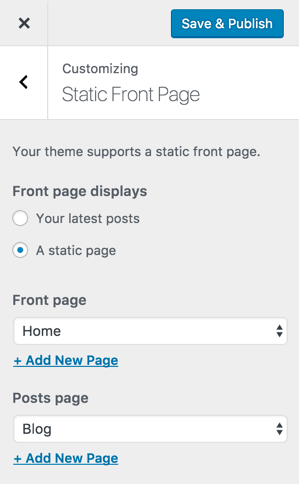 In your site dashboard add a new page, and title your new page "Home". Then, add another page titled "Blog". Be sure to publish these 2 pages. Launch the Customizer and click on the Static Front Page tab on the left. Then, select the "Blog" page you created from the Posts page dropdown.